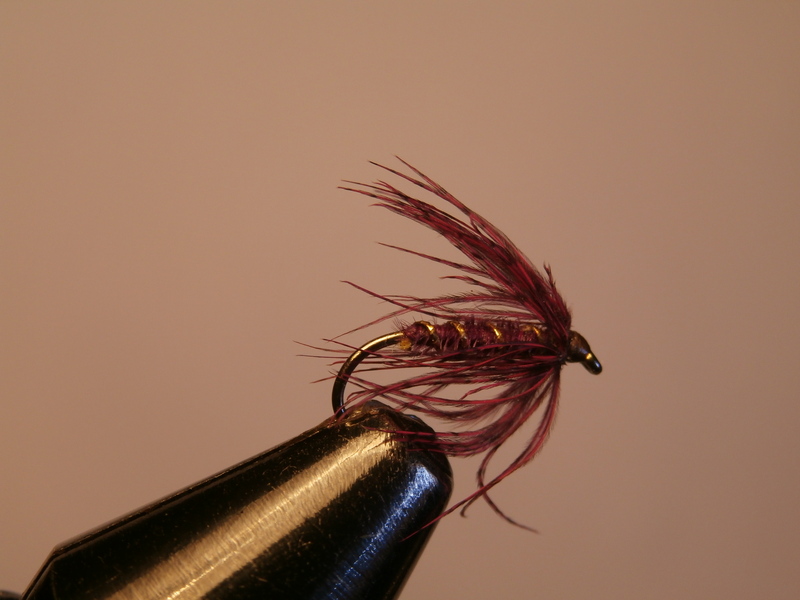 I use this style of nymph a lot both in ‘traditional’ nymphing and as a point fly on a wet fly cast. 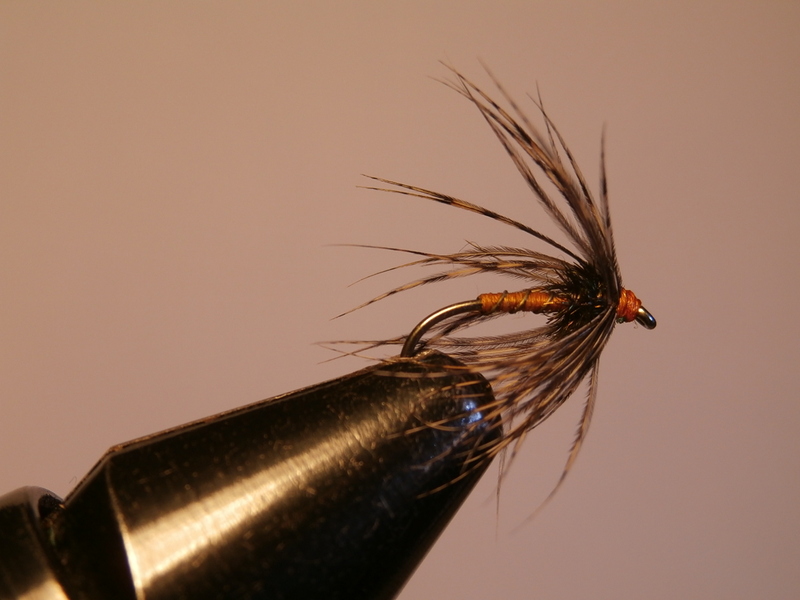 Obviously other tyers have developed this style and it is commonly used in different parts of the world for trout and grayling. 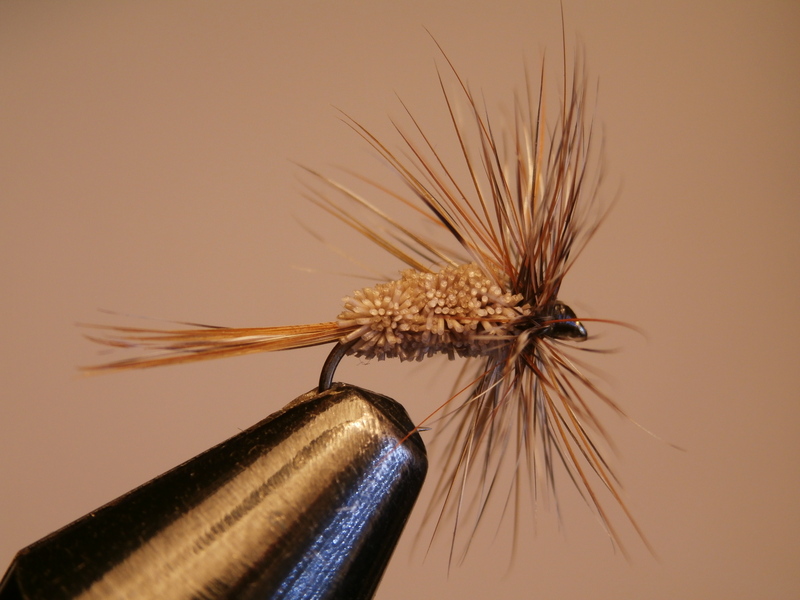 I love the extra ‘kick’ the bead gives to the hackle fibres which really adds life to the pattern. Start by threading a gold or copper bead on to the hook. I normally use a size 14 hook and a 2.8mm bead but you can go bigger or smaller as required to match local requirements. Now start the tying silk behind the bead.Wind down towards the bend and catch in a few fibres of partridge dyed brown olive. Continue winding towards the bend and catch in length of fine gold wire to use as a rib. 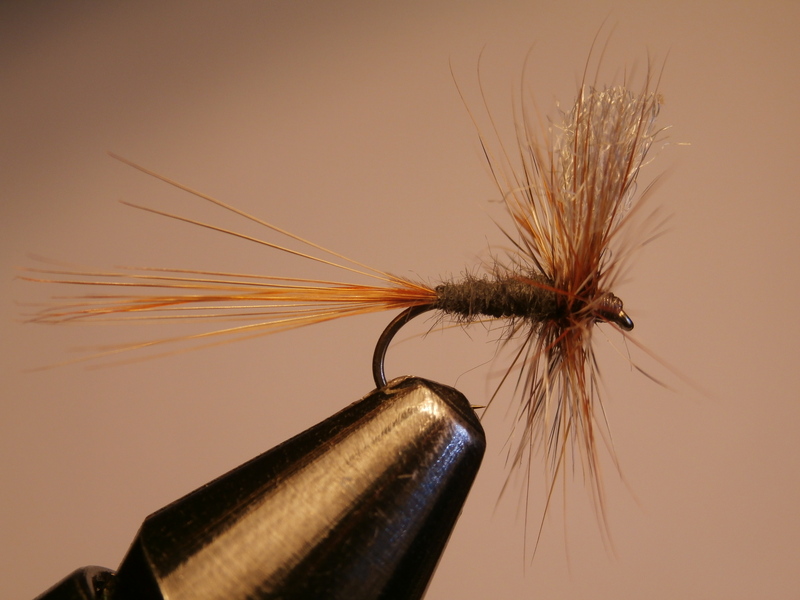 Now dub the silk with hare’s ear fur and wind a thin abdomen, stopping about 2/3 of the way back up the hook shank. Rib with open spirals of wire and tie off with the silk. Make a whip finish and remove the end of the tying silk. Now push the bead back against the abdomen, leaving space near the eye. Tying silk re-started in front of the bead. Notice the proportions. Re-start the tying silk in front of the bead again. 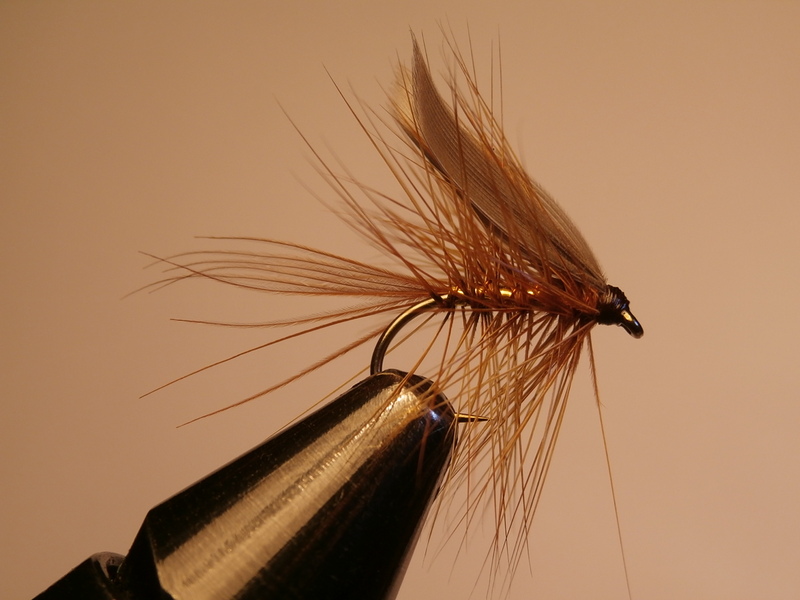 Tie in a partridge hackle which has been dyed brown olive. 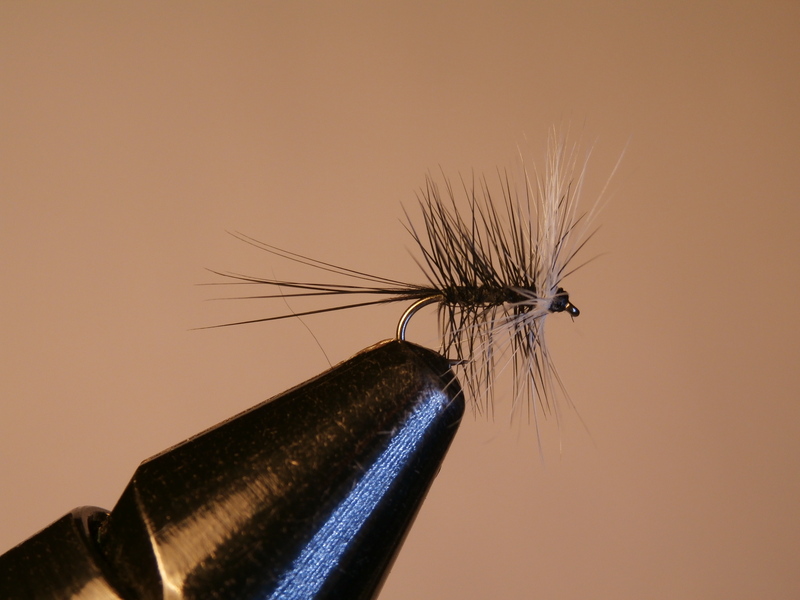 Two turns of the hackle are made around the hook and it is tied in. remove the waste and form a neat head before whip finishing and varnishing the head. The beauty of this fly is its versatility. It can be used in a wide range of conditions and fished in many different styles, so it is worth making few for your fly box. Colours can of course be varied as necessary but I have found the brown olive pattern illustrated here to be a consistent performer. 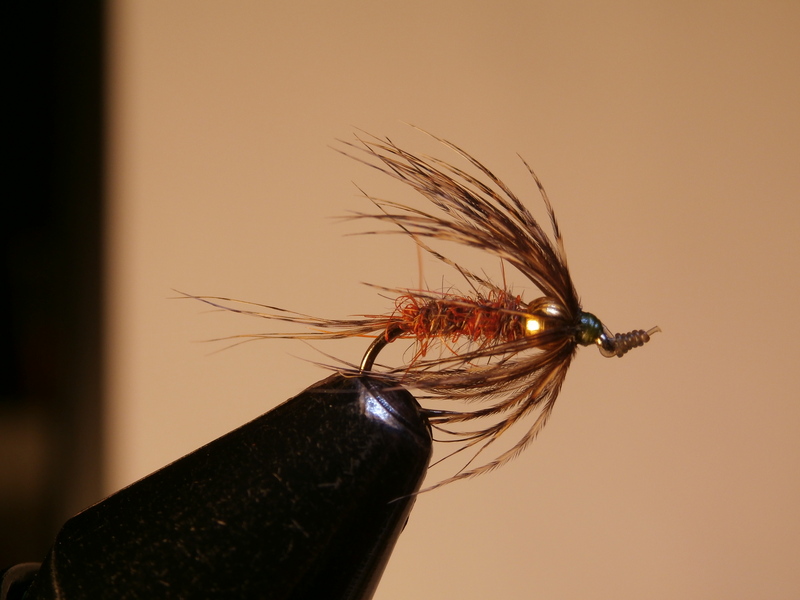 Some seasons we get a reasonable hatch of early stoneflies on the River Robe, so in anticipation of next year I made up a wee stonefly nymph along the lines of those great big American patterns. To get a bit of depth when using this pattern I have added a 2.8mm copper bead. 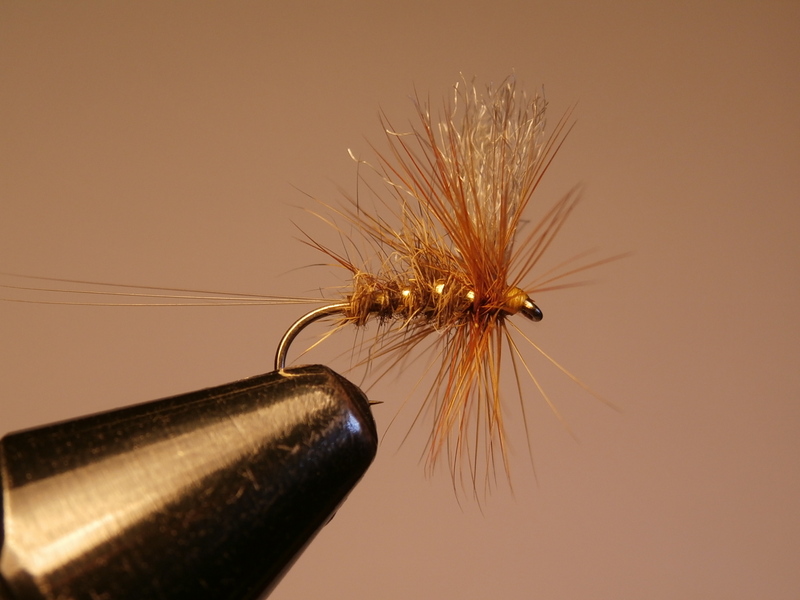 Begin by threading this on to a size 12 wet fly hook (here I have used a Kamasan B170). 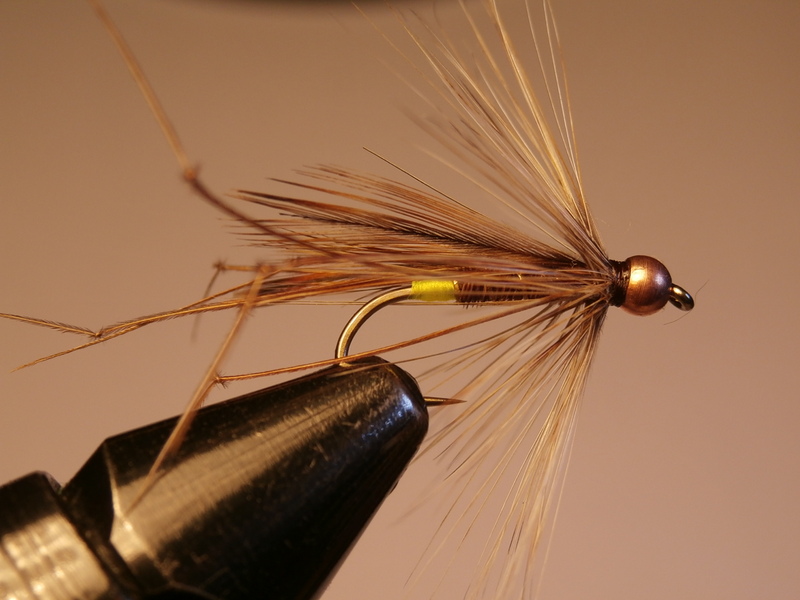 Push the bead to the bend of the hook while you start some brown tying silk and then catch in a pair of goose biots, dyed dark brown. These point forwards and are positioned either side of the hook eye. Now bind down the ends of the biots and whip finish before cutting the silk and wastes ends. Now push the copper bead back up to the eye over the silk base. Re-start the tying silk behind the bead and run touching turns down to the bend. Here you catch in another pair of biots but this time they face backwards to form a forked tail. Tie in a length of vinyl rib (I used rust coloured here) and take the silk up to about halfway between the bend and the bead. Wind the vinyl rib to form the body and tie it down. Next, take a section of herl from a Canada Goose body feather and tie it in. this will form the wing pads. 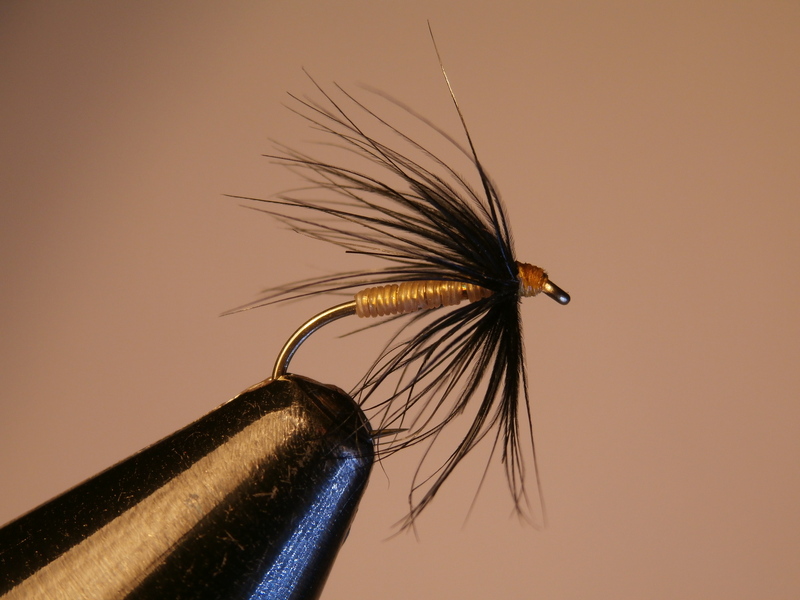 Now dub the tying silk with a mixture of dark brown and dirty olive seals fur. Wind the dubbed silk to form a bulky thorax, then pull the goose herl over the back, securing it immediately behind the bead. Remove the excess herl and whip finish. Now you get out the dubbing needle and tease out some fur from each side of the thorax to suggest legs. Trim off any excessively long fibres and varnish the whip finish. As yet untested, but this pattern should work next March! I will also tie up some with additional lead under the dressing for dropping into deeper holes. 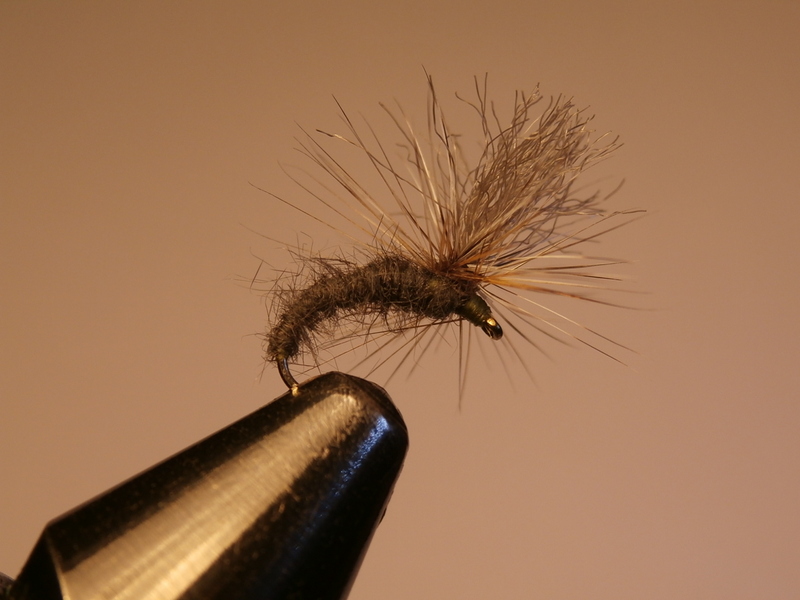 Most of the flies I describe on the blog are generally designed or used for Brownies, sea trout or salmon. We don’t have any rainbows around here so my boxes of lures and other rainbow trout flies lie gathering an accumulation of dust. Every now and then I take an urge to make up some more of lures kidding myself that they will be used one day in the near future. One of my favourites is the Gold Head Daddy. I have often asked myself what the hell the trout take this fly for? Do they really think it is a daddy long legs? I assume that they do on occasion as this fly has produced a good catch one day many years ago at a put and take fishery in Fife. It was late in the season and some naturals were being blown on to the surface where they were greedily snapped up by the fish. I caught a limit using a Gold Head Daddy and there is every reason to think this was due to it resembling the live beasties. However, many other times there has been no sign of a natural fall of daddies and yet the gold head was effective. 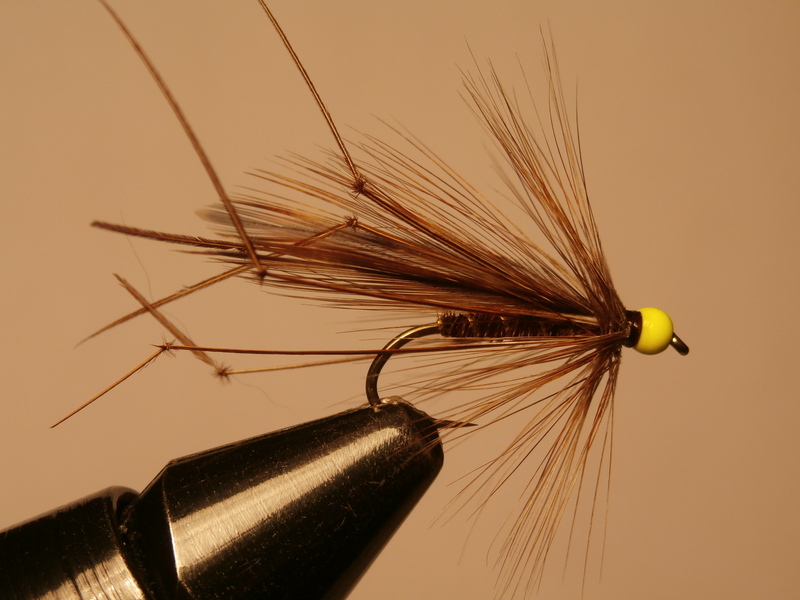 When it comes to actually fishing this fly I have a very effective trick for you to try out. Find a rising fish and cast into the rings of the last rise. You need to have your wits about you and reasonable casting skills to change direction and distance quickly to do this effectively. Once the fly has pitched into the diminishing circles of the rise do – nothing. No movement, no pulls or jerks, just let the fly sink freely. You will be amazed how often the line simply tightens and the rainbow is perfectly hooked in the scissors. Other techniques include a figure of eight retrieve and a fast strip on a sinking line, so you can see this is a versatile pattern to have in the box. I can’t say that have ever caught anything other than rainbows on the Gold Head Daddy but maybe it would be worth a go on some waters stocked with browns. Gartmore near Alloa springs to mind as a likely candidate.